Writing needs to be taught like any other basic skill, with explicit instruction and ample opportunity for practice. Almost every day, every student in grades K-5 needs between fifty and sixty minutes for writing instruction and writing. In an ideal writing workshop, time is allocated as follows: 10 – 15 minutes for a minilesson, 40 – 45 minutes for independent writing time (This includes five minutes for checking plan boxes and 40 minutes for you to confer and meet with small groups of students. ), and 5 – 10 minutes of share time. 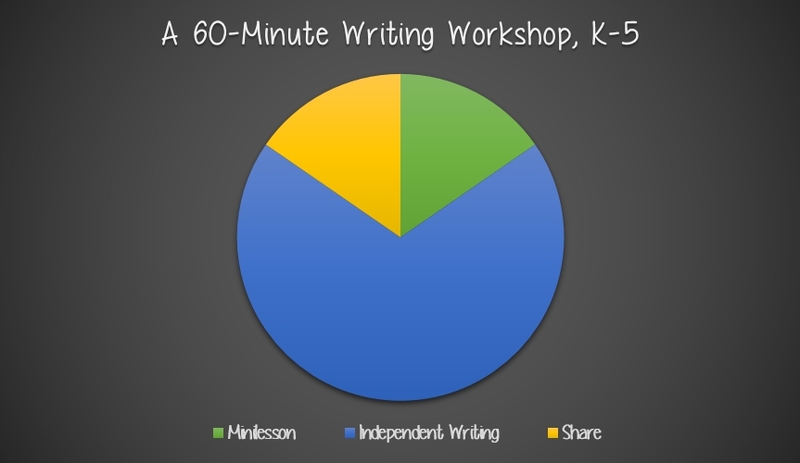 As this graphic illustrates, there are 10 minutes for the minilesson, 40 minutes for independent writing time, and 10 minutes for sharing. Like any other skill, children need long stretches of time to practice writing if they’re going to develop strong writing muscles. Seeing as muscles need to be used often to get bigger, it’s important teachers are providing kids with (four or) five times a week to engage in a writing workshop where they have at least 30 minutes of independent writing time. Without time to practice, kids won’t become stronger writers! You don’t get good at something by practicing it once or twice a week. This is why I was never a became a good flutist when I was a child. For three years, I took a lesson once a week, played in the school band once a week, and practiced whatever piece I was assigned for 15 minutes the day before my lesson. If I wanted to become a skilled flute player, I should’ve been practicing daily for more than 15 minutes at a time! As an adult, there are a handful of things (e.g., baking/cooking, needlepointing, Pilates, swimming) I can do well. Why? I have been diligent about devoting long stretches of time to get better at each of these things. Practice may not have made me perfect at all of these things, but regular practice has allowed me to declare myself proficient at each of these things. So back to writing. What kind of writing are kids doing during writing workshop? Youngsters not only deserve daily opportunities to write particular kinds of things — to write something that exists in the world — they also deserve opportunities to write for someone — for readers who will respond to what they have written (Calkins, 2013, 20). The best way for kids to produce writing that matters, writing they’re proud to share with a real audience, is to be given the right to write daily in school. If kids have the opportunity to learn from a teacher (who is a writer him/herself) every day, cycle through the writing process, and have exposure to lots of high-quality mentor texts (from which they glean craft moves they can make), then students will develop their writing muscles. In turn, this will provide the children we teach with one of the most important abilities they can possess: the ability to write well. For a chance to win one copy of The First Six Weeks of School, 2nd Edition, please leave a reaction to any post in the blog series, including this one, by Monday, August 8th at 11:59 p.m. EDT. Dana Murphy will use a random number generator to pick the winners, whose names she will announce in our blog series’ IN CASE YOU MISSED IT post on Tuesday, August 9th. If you are the winner of the book, Dana will email you with the subject line of TWO WRITING TEACHERS – THE FIRST SIX WEEKS OF SCHOOL. Please respond to her e-mail with your mailing address within five days of receipt. Unfortunately, a new winner will be chosen if a response isn’t received within five days of the giveaway announcement. Stacey!! This is POWERFUL!!!!!!!! Thank you, thank you, for writing it. 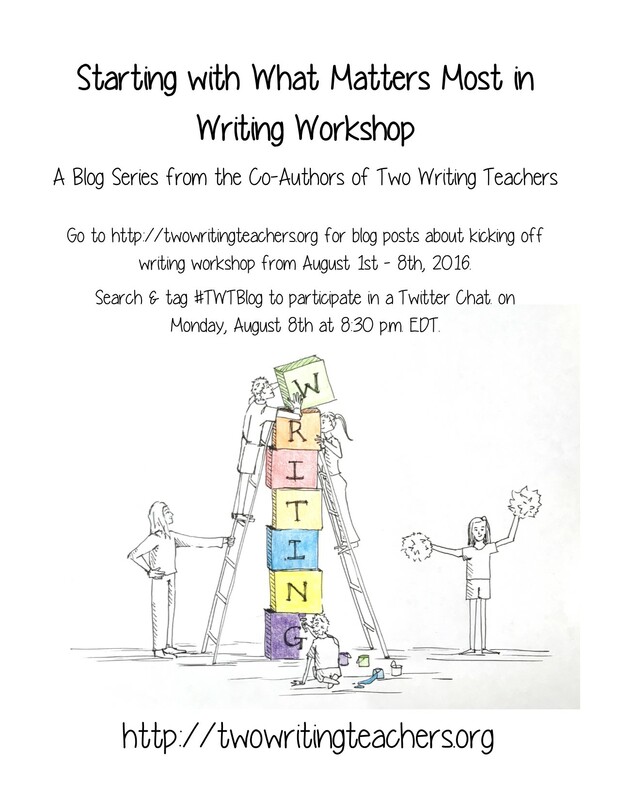 Enjoyed the refresher post about writers workshop as a new year gets started. Very important to embed the minutes for student writing. I am looking forward to trying some of these ideas. I know as a 4th grade teacher I sometimes struggled with the free choice part. I always started the year with it, but as testing time came near, I felt like I had to take it all alway. The kids loved writing when they had choice. I am changing to 1st and I am looking forward to fostering that love of writing in my kids! Thank you for the inspiring reminders of what is truly important in the teaching of writing! Imagine a world where every teacher practiced this … every child would be a writer! I am going to do better this year with teaching the writing process. I would love to have this book to help with that effort! Thanks for being a strong blog with solid advice to keep my workshop going. I am implementing writer’s and reader’s workshop this year. I really want it to go well, but I know that my students will not have the stamina to write for 40 minutes that first week. I am looking for help getting it off the ground in a positive environment. I teach 4th grade at a rural school in Nevada. Build up their stamina week-by-week. Start your fourth graders with ten minute of independent writing time once school begins. A few days later, increase to 15 minutes. A few days after that go up to 20 minutes. Keep moving up in five-minute increments until you get to 40 minutes. (That should be by the sixth week of school.) They will get there if you help them get there slowly! Thanks for the idea and the reminder that we need to start small and build upon little successes as students become more skilled, comfortable, and independent in the writing workshop at the beginning of the year. It’s so interesting to read all the posts in this series to see what each of us is highlighting as we think about what is most important. Your post, Stacey, is really the heart of it- the TIME to write. Without time to actually engage in the process, not much else will matter. I love your pie graph, showing how the bulk of time should be spent writing. Time *is* one of those basic needs when it comes to writing workshop. Thanks for the graphic! I love those visuals. And… I feel guilty that I WAS one of “those teachers” who cut out writing because lack of time. I’ve spent time in first-grade classrooms where the kids were engaged in a 60-minute writing workshop. It gave them plenty of time to talk, draw, and write (during independent writing), which I think is crucial at that age. I’d say if you have the time, use it all! Lucy’s words ring true and we all need to make sure that we carve out the time daily for students to practice. I admire your courage for persisting in emphasizing the importance of writing for students in the face of so many obstacles (lack of time, Common Core demands, crowded curriculum, etc.). In the long run, writing will prove far more important to them in their adult lives than many other things they are being forced to learn/do. Bravo to you and all who persist in making time for writing in your teaching day! I originally had a section in this post that explained how I won’t even work with a school district unless they commit to carving out the time in their teachers’ schedules for writing workshop at least 4x/week. I removed it since I revised the piece and it didn’t seem to fit. But the time thing is something I believe in STRONGLY! I’m particularly moved by Lucy Calkins’ argument that teachers would never dream of not teaching math, or only teaching math implicitly through other subjects. Why then is writing overlooked? Great post! Helping children develop as writers through daily independent writing time is one of the most important choices a teacher can make. How else do we give a child the tools to communicate with others effectively, with agency, for change? I’m constantly reminded by Lucy Caulkins to model and then stand aside to let the children go. I’m grateful to be part of a community of writing teachers who remind me of this. Thank you so much for this post. It is some timely as I begin to travel the workshop path. It is comforting and stress reducing to know that there are mentors out their to lead the way and share the experience. Again I see that the greatest gift I can give my students is time to practice their craft and develop their writing muscles. So simple, so basic. Once again, Lucy says it so well! Thanks for sharing this concise, yet clearly explained vision for writing instruction! I’ve found that there are things a lot of teachers aren’t willing to give up (special units/projects they’ve taught for years) that require time. Hence, writing gets pushed aside. And it’s a real shame because writing workshop is such a beautiful time in the school day! It is the MOST beautiful time in the school day! Caulkins raises such an important point — we don’t get to decide if we are going to teach math and reading, why is it acceptable to choose not to teach writing? I think some teachers take this route because they don’t know HOW to teach writing. Thankfully, there are blogs like this one and an inspirational online community that can help in that area. So well said, as always. The points about writing daily being essential remind me of writing workshop pioneer Donald Graves. His response to teachers who could only get to writing instruction one day a week was “Don’t teach it at all.” He emphasized: “If students are not engaged in writing at least four days out of five for 35-40 minutes, beginning in first grade, they will have little opportunity to think through the medium of writing.” Preserving the time to write daily is of priceless value. It ultimately pays off in all academic areas. I find myself being in the same camp as the great Donald Graves.